What defines success? We asked Receipt Bank partners on the daily habits that help them get more out of their life and practice. Advice from over a hundred accountants and bookkeepers showed that getting ahead includes to-do lists, music and setting aside time to think about the bigger picture. How many do you practice? 1. Go to work on an endorphin-high. Work out before work, for increased energy and more productivity. It's no secret exercising does wonders for your health, focus, concentration and happiness. A study from Bristol University found people were 21% more productive on workout days. They concentrated more, finished work on time, could work for longer without unscheduled breaks and felt 41% more motivated. Make sure my son hears I love you and has a big hug at least once a day. Hugs make people feel happy. I know it sets him up for the day and I go to work content. Make sure you drink 2-3 bottles of water a day. 4. Practice good email hygiene. Check emails first thing and deal with anything urgent first. All else can wait until later in the day. There were plenty of tips on how to manage your inbox efficiently, suggesting this is one of the biggest barriers to productivity in the workplace. According to MicKinsey, reading and replying to emails takes up about 28% of our total workweek. To help reduce it, our partners suggest switching off notifications for a couple of set hours every day to cut out the distraction. 5. Get some fresh air. Take the time out to go and walk the dog, get some fresh air and do some thinking. Do you get your best ideas when walking? You're not alone. This report from Stanford University found that the mind-body connection is very real. Those who walked during the study increased creativity by up to 60%. 6. Get bank reconciliations out the way over breakfast. Reconcile my bank every morning. Bank reconciliations can be time-consuming and prone to error. There's now a whole set of features available, designed to make the process more efficient. Just take Bank Match, a feature available for users on Xero and Sage Accounting. 7. Check into the Receipt Bank dashboard. Weekly log into the Receipt Bank dashboard to stay on top of outstanding invoices. The Partner dashboard gives you a holistic view of each Client Account, including the number of items outstanding. Click here to find out more. 8. Use Auto-Publish to its fullest. Find every supplier that I can auto-publish for clients. Auto-Publishing is one of the most powerful tools in your arsenal if you're looking to make some serious time savings. Choose suppliers you trust, and have them publish to the general ledger automatically. Click here to read more. Smile! It makes those around you smile too and makes you feel happy. 10. Block out your time. Schedule time in 1-hour blocks. It's a smart way to structure your day and master your time. Try identifying your top priority and designing the first few hours of your day around it. This interesting article from Entrepreneur takes it further. 11. Raise your post-it note game. 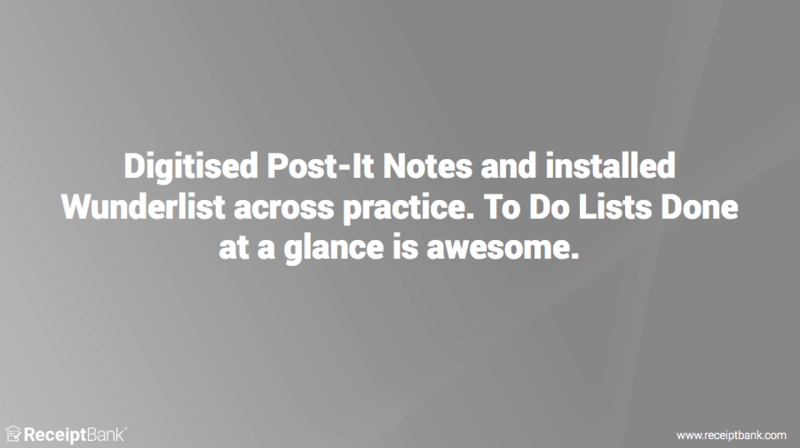 Digitised Post-It Notes and installed Wunderlist across practice. To Do Lists Done at a glance is awesome. 12. Use technology to help stay on top of workloads. Using a self knowledge base and ticket system - saves me time and helps me keep on top of customer requests. There are so many tools out there to help with project management. Our tip is to choose one - for instance, Asana or Trello - and take the time to learn it before rolling it out with your team. 13. Keep a log of all work completed on a daily basis. Analyse budgeted time vs actual time spent by task type. 14. Chunk big jobs into smaller ones. Dissect jobs into small, more manageable targets. 15. Make a to-do list. I love being able to cross things off the list, no matter how small the item is. It gives me a sense of accomplishment. This was the most popular answer by a mile! Another tip is to keep a notebook with you at all times to jot down notes and ideas. 16. Take a social media detox every once in a while. Keep myself off social media for 1 day a month. It's been named the number 1 productivity killer, with nearly 90% of employees openly admitting to checking social media during work hours. Try going cold turkey for a while to see if your productivity improves. It's an interesting experiment to see if, and how, your focus changes without distraction. 17. Set aside time to work ‘on’ the business. 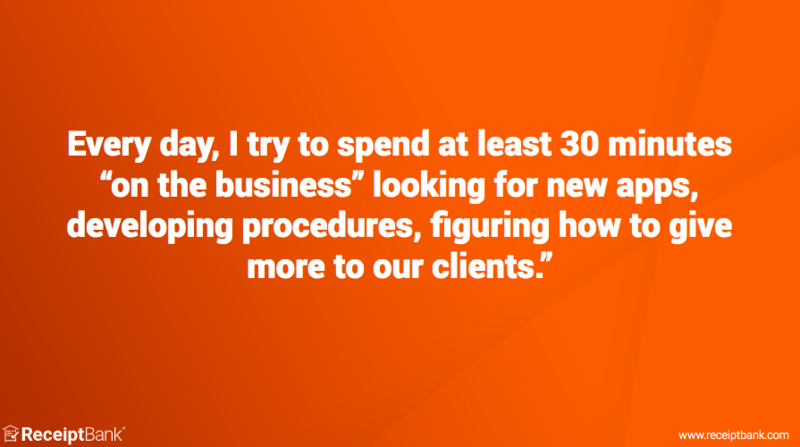 Every day, I try to spend at least 30 minutes “on the business” looking for new apps, developing procedures, figuring out how to give more to our clients. We love this one! It can be so easy to work in your business, rather than on your business. Rather than constantly fighting fires, set aside some time if you can to think creatively about your business. Even if incremental, this time for strategic planning, research and reflection will make a huge difference. 18. Batch tasks for ultimate efficiency and fewer distractions. Keep small tasks aside until I have enough to batch. This saves time by reducing the amount of times you switch between programs and tasks. 19. Make sure you’re getting enough beauty sleep. Ensuring I’m in bed by 10pm. 20. Stop and smell the roses. When you're striving for the next big thing - whether that be a promotion, raise, business award or commercial milestone - it can be easy to lose sight of what's around you. This is just compounded by our 'always-on' culture. Research into positive psychology draws a strong link between practising gratitude and productivity. For individuals, it generates more happiness and health. If you're a manager, expressing gratitude can raise your team productivity by up to 50%. In one study, people who kept a gratitude journal on a weekly basis exercised 1.5 hours more and slept better. Spending just five minutes writing down what you're grateful for can increase your sense of wellbeing by about 10 per cent. Want to join the conversation? Meet other Receipt Bank partners and like-minded professionals on our global partner community, Orange Select.